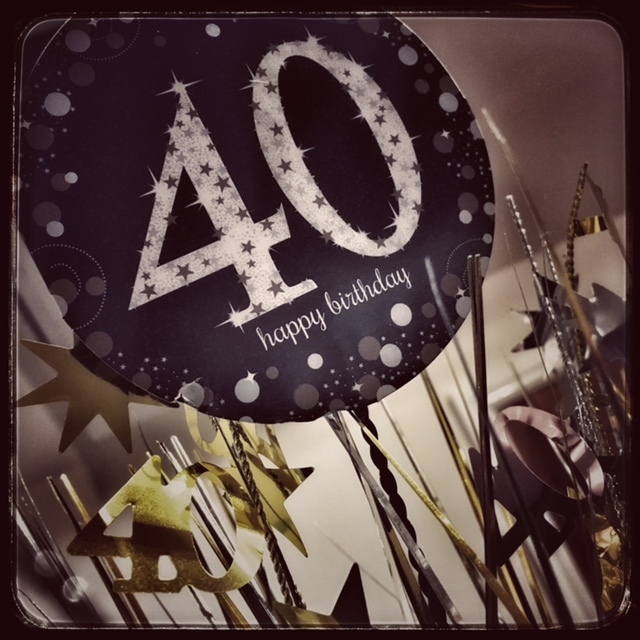 A few weeks ago I reached the big 4-0. I know, I know, I don’t look a day over 25 (or so I like to tell myself). So, in preparation for the big day I went through the usual dilemma of what I should do. Having a birthday in February does mean you’re somewhat limited with options – I’ve always wanted to have a BBQ, but the weather doesn’t lend itself to this. Standing outside in shorts and a T-shirt whilst grilling burgers and sausages doesn’t feel like a winter event. Plus, it usually snows around my birthday – and one year my planned party ended up being ‘snowed off’. It was a heavy dumping of the white stuff and the entire public transport system and road network across London ground to a halt. But on that snowy February day, my housemates, a couple of friends and I still celebrated, making a snow man and eating far too many pizza and pastry-based party foods (they lasted for weeks as I’d purchased enough to feed an army). The last few years I’ve had much more low-key birthday celebrations, but with this year being a milestone, it felt I should do something to celebrate. So, I arranged for some drinks at a cocktail bar in central London and I’ll have to say there was a bit of me that was worried that no one would turn up and I’d be left sipping a drink on my own. But as soon as I sent out the invites, the response was reassuring. School mates were travelling down from the North West (or flying in from Switzerland), university friends I hadn’t seem for a long time confirmed their attendance and friends with children were booking baby sitters. Everyone was making an effort to come. I was chuffed. The night went really well. People from different times in my life were meeting together in one place. Some had met each other before, for others it was a first-time meeting and everyone seemed to be enjoying each other’s company. As I sat there in the room I was grateful to have so many fabulous friends that had wanted to come to celebrate my birthday, and spending time with those people was bringing happiness, not only to me, but to others in the room. Recent research by William J Chopik found that family and friend relationships are not just important but are associated with better health and happiness overall and that, as we get older, this link remains for those who report strong friendships. Another study in the same report found that, as we get older, it is also the quality of those friendships that are important. Chopik found that people who said their friends were there as a source of support, were happier. And how do we strengthen those friendships? It’s about spending more time with each other. When I’m with friends, finding out what they’ve been up to, joking around with each other and having someone take an interest in my life – it makes me feel good. On the night of my party I remember thinking how nice it was not only to see people, but to hear about their news too. With the busyness of all our lives it can be a struggle to find time to meet up, and it’s all too easy not to create space for those we care about. But it’s all about prioritisation – I’ve made a decision to prioritise my friends; to make more effort to meet up, and to find the time to do so. So now, a few weeks on, I’ve already met up with a couple of people that couldn’t make it to my party for belated birthday celebrations, I’ve booked to go to see friends in Switzerland, and am planning yet more visits. Friendships prioritised; happy times.